Back row l-r: Miseon Lee, Cara Dunne, Debbie Godsell, Gillian Cullen, Yvette Monahan, Mandy O’Neill, Brian Hunt, Head of Regulatory Affairs & Head of Government and Industry Affairs, Zurich Insurance, Brendan Rooney, Curator, Stephen Doyle, David Booth Martin Redmond, Nicholas Benedict Robinson, Jonathan Mayhew, Gillian Morrow. Front row l-r: Will O’Kane, Peter Bradley, Robert Ellis, Thomas Jenner, Fionn McCann, Darragh O’Connell, Connor Maguire, and Salvatore Fullam (Salvatore of Lucan). The Zurich Portrait Prize shortlist was announced this morning and now the 25 artists’ works will go on display at the National Gallery of Ireland. Identity, privacy, place, family and social change are among the themes addressed by the artists who have been shortlisted for this year’s National Gallery of Ireland’s Zurich Portrait Prize. A total of 25 artists from a variety of backgrounds, working across a multitude of creative disciplines, have made it through to the final stage of the competition, from an initial pool of nearly 300 entrants. The aim of the Zurich Portrait Prize is to foster an interest in contemporary portraiture amongst artists and art lovers alike, while adding to the National Portrait Collection at the National Gallery of Ireland. This year’s panel of judges comprises Geraldine O’Neill, Sue Rainsford and Tanya Kiang. This is the first year the prize has been sponsored by Zurich. 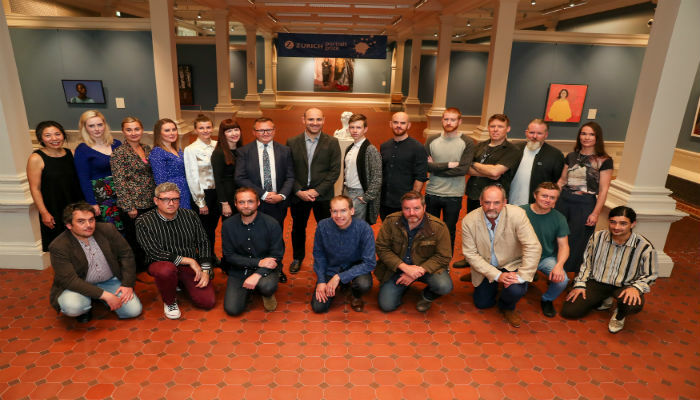 The winning artist will receive a prize of €15,000 and a commission worth €5,000 to produce a new work for inclusion in the National Portrait Collection. Two additional prizes of €1,500 will be awarded to highly-commended works. Announcing the shortlist, Director of the National Gallery of Ireland Sean Rainbird said: “The Zurich Portrait Prize is a very important date in the Gallery’s diary as it allows us to not only encourage interest in contemporary portraiture, but also to bring our National Portrait Collection front and centre. Acknowledging the contributions they have made to Irish life, modern additions to this collection include portraits of icons such as social justice campaigner, Sr Stanislaus Kennedy, designer John Rocha, hurler Henry Shefflin and, most recently, film director Lenny Abrahamson. The shortlisted artists’ work will be exhibited in Room 23 of the National Gallery of Ireland from Saturday, 6th October 2018 until Sunday, 13th January 2019. Admission is free. The winner will be announced on Monday, 22nd October 2018. See the National Gallery of Ireland for details of the shortlisted artists and their work. The Zurich Portrait Prize is open to artists in all disciplines who are either resident in Ireland or Irish citizens living abroad. The aim of the competition is to showcase and encourage interest in contemporary portraiture, and to raise the profile of the long-standing and constantly evolving National Portrait Collection at the National Gallery of Ireland. The competition is in its fifth year.